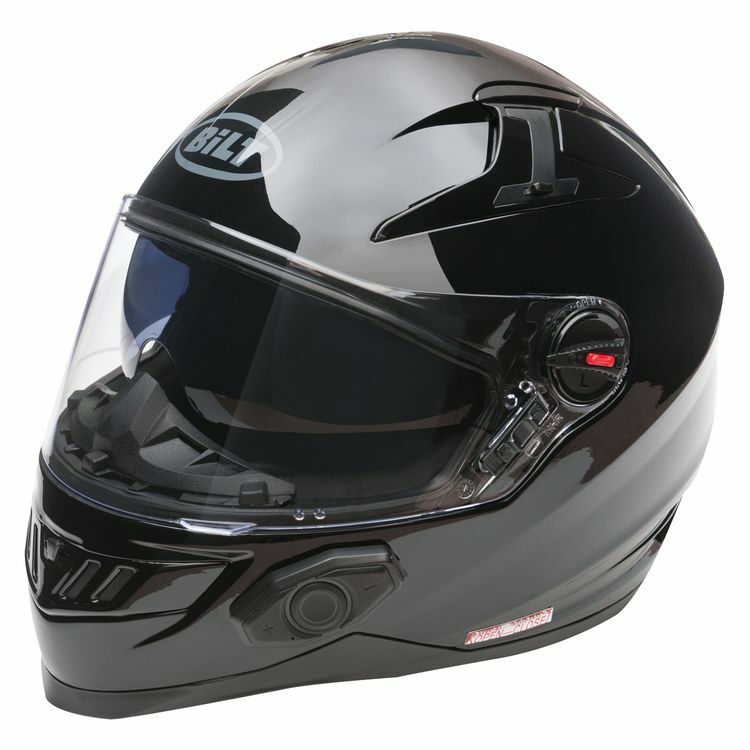 With integrated SENA DWO-5 Bluetooth technology out of the box, the BiLT Techno 2.0 Bluetooth Helmet continues to be the most technological helmet on the market. Ready to sync with any Bluetooth-enabled devices, the Techno 2.0 Helmet also has great ventilation, a removable liner and a drop-down tinted sun shield all in a convenient full face design. Had the helmet for a month, love the overall quality and features. A little noisy but not more than helmet in same price range. Bluetooth works great even on universal mode. As long as the other riders speak clear the helmet is awesome for cons. The clear shield and flip down tinted lens are great! This helmet is very comfortable. There is not a lot of wiggling around to get the correct fit from the helmet. The clear and shaded lenses are super easy to use and convenient. At 45 mph I had a phone conversation where the other person had no idea I was on a bike and said it was clear. There are a lot of features for the price you pay for this helmet. I would buy it again and highly recommend. 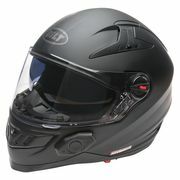 More noisy at higher speeds (but not more than other helmets in this price range). The speaker quality is average. The switches for vents are a little small and could be easier to find. I bought this helmet 2 weeks ago and mainly because the Bluetooth, it's looks good, fit great. This helmet is awesome I laid my bike at 70 when I hit a massive gravel patch, the helmet was completely destroyed but the only reason I'm still alive and here today was because I was wearing this helmet. After the crash I was looking at how messed up my helmet looked and thought to check the Bluetooth and after the wreck it still works. So, when it comes to helmets, I would buy this one all over again because I kept me alive and on top of that how can you not like riding with a helmet that has Bluetooth! The bluetooth system is great. I can hear music clearly at highway speeds plus. Made a call at 80 mph and the person on the other end said i was clear as a bell, they were a little hard to hear. I had to take the guard that goes around you nose out because i wear glasses and they were very hard to get on with it installed. The helmet was tight when i bought it but the crash pads are already starting to wear in and the helmet is as comfortable as my icon. I only with they had something beside black and white but the helmet/bluetooth itself are perfect. Everything i was hopping it would be for my first bluetooth helmet. Cycle Gear was also perfect. Called them to ask a question and was talking to a real person within minutes. They answered my question quickly and were very polite. The helmet took less than 24 hours to show up at my doorstep, granted Cycle Gear had a distributor in my state. But still less than 24 hour turn around, that is A+ in my book. Thanks Cycle Gear and Thanks Bilt. This is my first ever open road full face helmet since I ride a touring cruiser I usually wear a half helmet. I have only had the helmet for a couple of weeks but I love it. The helmet is definitely comfortable out of the box in my opinion. Good ventilation, good features for the price. As I was not sure I even wanted a full face helmet, this was a great choice. I wanted Bluetooth that would work over several platforms and this helmet fit the bill. It works with my work cell, personal cell and helmet to helmet when riding with a passenger or to another motorcycle rider with Bluetooth. I can hear my music loud and clear and I like the drop down sun shade. Wind noise as mentioned in other reviews but not bothersome to me. To summarize, great styling, generous features, full featured Bluetooth functionality and you can't beat the price. This helmet is the replacement for the first Techno helmet they released. The first one was terrible, the buttons came off and the speakers went out ! Well I decided to give this one a try, hoping just maybe it would be an upgrade of need features and durability the first one don't have. At first glace the helmet looks great, fits snug and is super light-weight. When you start to look closer you notice the cheaper parts which are opening for vents and air-flow. Now, the blue-tooth is exactly what I bought this helmet for, I must say its an upgrade from the last one, I can clearly hear my music at 90+ MPH. With Volume maxed out you loose bass but treble stays strong, with only a little distortion depending on how much bass in the song. That would have been nice if we didn't have to send the helmet back because the Bluetooth went out ! It wouldn't stay on nor hold a charge. Luckily they got another one out quickly, this one worked perfect. Until today the drop down shaded visor stopped working, we literally just got the helmet 2 days ago and already another broken function. I was really hoping this could replace the Original Techno helmet that obviously failed, which is why they released this Techno 2.0. 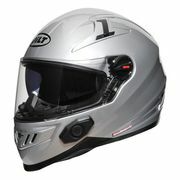 But alas, its another cheaply over-priced helmet. Ill just shell out the cash for a Sena and a much better quality helmet. I will definitely be sending this one back ! ARE YOU KIDDING ME Bilt !!!!! Great Helmet for the dollar. Priced and sized to fit. The blue tooth works well and I have made several phone calls while riding with no problems. This helmet cannot be beat for the price. It's light and comfortable. I regular amount of wind noise but I have no trouble hearing or being herd through the Bluetooth. And the Bluetooth is awesome. Works flawlessly and here you receive the helmet and Bluetooth for less than most decent Bluetooth set ups alone. The matte black does scratch pretty easily so take care with it, as it looks great as it comes. I found the helmet to run on the large side for sure. I'm a 7 1/4 hat size and ended up in an XS and it fits great. So happy with this product!! And Cycle Gear customer service is top notch!! Thanks Doug in the Charleston store. Everything is perfect about this helmet. This helmet rocks. Nice fit, great bluetooth connection, comfortable and sweet style. This helmet is amazing! I Was skeptical because of some bad reviews about receiving faulty helmets or it being of low quality but all of that was proven wrong the second it was delivered to my door. It's a great looking helmet with a lot of quality put into the build of the entire unit. The Bluetooth works AMAZING and is very easy to get the hang of, although I would suggest some practice switching songs, changing from music to intercom, and using speed dial and voice controls to send texts and make calls because it may get frustrating while on the bike if you don't know how to work the Bluetooth properly. In all it's an awesome helmet and for the price, you can't beat it. I'm buying a second one for my wife and recommending it to my riding buddies. Yes guys, with this one we need to read the directions. What are the certifications? Is it DOT, ECE, or Snell Approved? BEST ANSWER: This helmet is DOT Approved. Can you have music playing while still being able to communicate with your passenger? Would two linked helmets have to listen to the same Bluetooth music device? BEST ANSWER: Hi...just bought one for me and wife. I share my music off my iPhone with her and she can control the music from her helmet as well. To talk either her or me push the button once and the music stops and we talk. Then when done push again and music starts. really cool. I don't think you can talk while listening to music but you can both listen to one device! 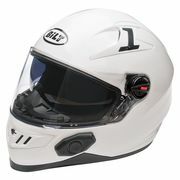 WHAT SIZE HELMET (S, M, L) FOR HAT SIZE 7 1/8 ? BEST ANSWER: Depends on your head shape. I though I would wear a Large but these helmets run small so I am in X-Large. Best to measure your head and try one on if at all possible. Since it says "universal", will it communicate with Cardo Scala Rider G9 etc? 3XL25.6-26 all are in inces, so try a hat that fits & buy the helmet in the range of the sixes. I require corrective lens, will I have any problems? BEST ANSWER: I find it hard wearing my sunglasses with the helmet because of the rubber nose guard. But another reviewer said they just removed it. Is it compatible with the new Sena Freewire? Is this communicator compatible with the SENA gopro audio pack? BEST ANSWER: Yes The SENA GoPro audio pack does pair with this helmet. 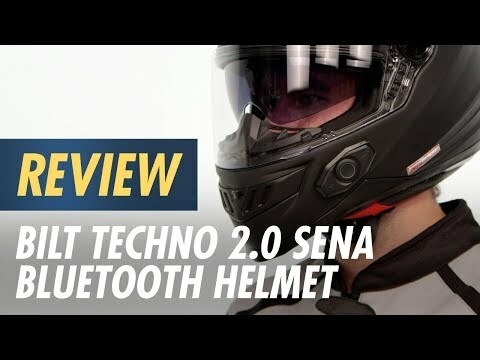 Although SENA has not yet updated the SENA Bluetooth pack for it to work with HD audio. Do right now you just have stranded audio. Check out "RyansHutch" on YouTube. His Latest Video "Motorcyclist Touching Rock Wall Going 70?! " uses the Helmet about halfway though. when installing the SENA GoPro backpack. it has 2 options. One for Bluetooth mic recording (the Mic in the helmet) and external mic(mic on SENA Backpack). I recommend only using the Bluetooth mic option (Just Turning on the Backpack and leave the mic switch off) as you tend to get an echoing affect with both switched to on. All said and done you just put the helmet into pairing mode and you put the SENA Backpack into pairing mode and your good! Go Watch RyansHutch to get an idea of what it sounds like! BEST ANSWER: 3 other helmets so 4 people including you can be connected. But that only works if all helmets are sena Bluetooth modules. If you're cross connecting between two brands it only allows you to connect to one other helmet. Is there padding at the chin? BEST ANSWER: There is a chin skirt, but there is no padding in any helmet chin area that I know of. There is a mic boom you will have to move this or that way to get out of the way. There is no padding for the chin! What comes with the helmet when you purchase? Does it come with a bag? BEST ANSWER: Yes it does come with a bag, instruction booklet and charging cord. Bluetooth works great, can't beat it for the price! It comes with a covering bag, and a manual for operation. It does come with a bag as well as a manual for the sena.